What do we mean by distributed systems? 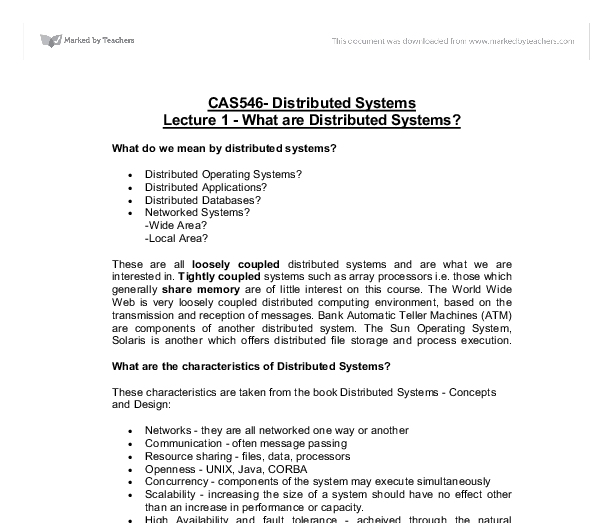 CAS546- Distributed Systems Lecture 1 - What are Distributed Systems? What do we mean by distributed systems? * Distributed Operating Systems? * Distributed Applications? * Distributed Databases? * Networked Systems? -Wide Area? -Local Area? These are all loosely coupled distributed systems and are what we are interested in. Tightly coupled systems such as array processors i.e. those which generally share memory are of little interest on this course. The World Wide Web is very loosely coupled distributed computing environment, based on the transmission and reception of messages. Bank Automatic Teller Machines (ATM) are components of another distributed system. The Sun Operating System, Solaris is another which offers distributed file storage and process execution. ...read more. o Access o Location o Concurrency o Replication o Failure o Migration o Performance o Scaling An Example An Air Ticket Booking System (Hypothetical) The requirements of such a system includes a high level of reliability, security against external interference and privacy of the information that the system holds. The main problems Taken from the same source. * Naming We need some means of referring to objects uniquely, wherever they are in our system. In the worst case the system could be the entire InterNet. * Communication We need a high speed communication infrastructure which supports the high level softwrae structures we use. * Software Structure - for us this will almost always be object based, though we will look at some non object based systems ...read more. 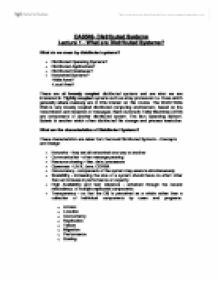 The Course Structure Initially we will be looking at some of the infrastructure needed for distributed systems in particular Remote Procedure Call (RPC) and its object oriented relative Remote Method Invocation (RMI). We will also look briefly at communication between processes mainly using BSD sockets. With this infrastructure we will look at the provision of distributed services e.g. Sun's Network File system (NFS). A major component of the course will be an investigation of Jini as a distributed application infrastructure and the use of this to support a high level framework such as JavaSpaces. These examples will allow us to look at the use of transactions and at design patterns or distributed systems. Other distribution mechanisms (CORBA and DCOM) will be considered in the light of the facilities provided by Jini. Finally we will discuss security issues and the provision of distributed database systems. ...read more. or kinetic energy (spinning flywheel). A mechanical energy reservoir is an idealized system in which the energy is stored, received, and delivered in a reversible manner. Heat Engine: A heat engine operates in a cyclic manner and exchanges thermal and mechanical energy with other systems. Hyperlinks can lead the individual to related sites. The CD-ROM is in a single location - have to possess it to look at it. The same WWW resource can be accessed from anywhere as long as the address is known. h) To understand what the quality of information produced will be like, we must determine how good the data entered is. * Review prototype The prototypes and functionalities are then reviewed, within this stage each one is analysed in detail to see how it works and how it will be organised. This can be done using testing from end users, this users the results from the test and the feedback given as documents. With regards to website construction the following document markup languages certainly need mentioning: HTML Hypertext Markup Language (HTML) is the most widely used markup language for web pages. Using HTML, you can use the structure of text based information to create documents, i.e. web pages. HTML works by using tags. multiple users each able to run programs concurrently A10. 1 Q11. Processing can be carried out interactively or in batch mode. The method used depends on the application. Payroll, billing and other regular processing that repeats the same task on a weekly or monthly basis is best carried out: 1.